One escape route from the major-label downloading file-sharing meltdown dilemma is to opt out of the conventional music industry-structure entirely, and distribute through other outlets. Bob Dylan, Paul McCartney and James Taylor sign to Starbucks. 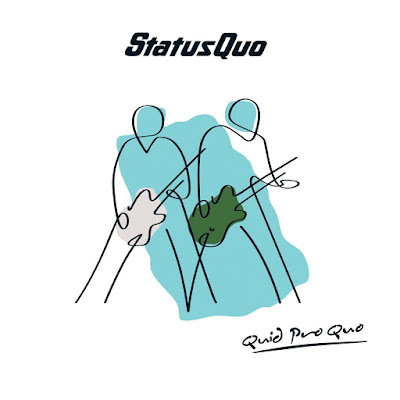 And Tesco Enterprises launches its CD brand with Mick Hucknall, Nadine Coyle of Girls Aloud… and now, Status Quo. But in every other way, this is no radical departure for the Quo, did you really expect it would be? I mean, Quo are just about as predictable as your weekly checkout receipt anyway, right? And this CD is high on their signature sound. But can they still deliver? Listen to “Two Way Traffic” and it’s undeniable, a ‘work-work bizzy-bizzy bang-bang 25-hours a day’ boogie. “Let’s Rock” which is both a manifesto, and a recapitulation of their finest glory-day’s moments. And isn’t “Anyway You Like It” another way of saying “Whatever You Want”? With Tesco corporate-sponsorship, Every Little Helps, so they add their 2010 overhaul of their “In The Army Now” too. On this evidence, no La-di-das, they’re in rude health. In the interests of free-market competition we are legally obliged to point out that other supermarket chains also operate in your area.